Our approach therefore must be from the ground up. We combine theoretical research with practical application at the local, regional, national, and international levels—deliberately designing transformative systems and communicating clearly the principles that guide them. E. F. Schumacher Annual Lectures — Established in 1981, the collected Schumacher Lectures capture some of the most visionary voices regarding the urgent need to transform our economic, social, and cultural systems in a way that supports both the planet and its citizens. Schumacher Library — Housed in a 2,000 square foot building on the side of Jug End Mountain in the Berkshire region of Massachusetts, this research library includes the books and papers of Dr. Schumacher and other new economists as well as collections on worker ownership, community supported agriculture, local currencies, the commons, and appropriate technology. Its catalogue is searchable online. 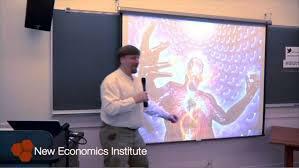 Events – Lectures, conferences, and seminars on themes of a new economics. Commons — A part of building a new economics is to shape new institutions around land, labor, and capital. The Center’s Commons Program provides information on the history, theory, and application of the community land trust model and other new land tenure approaches. BerkShares — BerkShares is the best-known contemporary example of a place-based currency. The Center’s Local Currency Program provides information on the history, theory, and application of BerkShares and other community financing tools. Agrarian Trust — Working with Greenhorns, a young farmers advocacy group, the goal of the Agrarian Trust is to move land into the hands and care of next-generation farmers who are building resilient regional food economies.